Other than caring for my two younger siblings, I have experience with children from teaching Sunday school classes for children ages 2-6, participating in a Horizons daycare class for 2-3 year olds, and I have also looked after children and toddlers of friends and family with ages ranging from 2-12. I also have a small amount of experience with teenage special needs children as I helped in the special needs classroom at Chester High School. 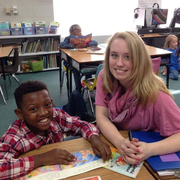 I was a teacher cadet and had a class of 19 amazing second graders and I am currently enrolled in Winthrop University for elementary education. I'd like to consider myself as friendly and can adjust myself from being loud and playful with energetic children or calm and quiet with shy children. I'm great with dividing my time and prioritizing so looking after more than one child would not be a problem. I was a tutor Read more in high school for approximately two years and can help with homework or schoolwork. I have paid experience with housekeeping and can prepare small meals and snacks, do laundry, wash and put away dishes, and other household chores. I am very comfortable around animals, even exotic pets such as snakes and lizards. My hourly rate is flexible and can be discussed. If you are interested please don't hesitate to send me a message!